A few spots still available!!! Skip Morris brings over 40 years experience and a wealth of knowledge about fishing the Northwest’s waters. He has written 18 books on fly fishing and fly tying over the past 25 years (among them, Fly Tying Made Clear and Simple, Western River Hatches, Trout Flies for Rivers, and Morris & Chan on Fly Fishing Trout Lakes) along with over 300 magazine articles. Skip has hosted a national fly-fishing television show and appeared on several instructional DVD’s. The spring 2014 issue of Fly Tyer magazine awarded Skip Morris as the winner of the magazine's Lifetime Achievement Award! 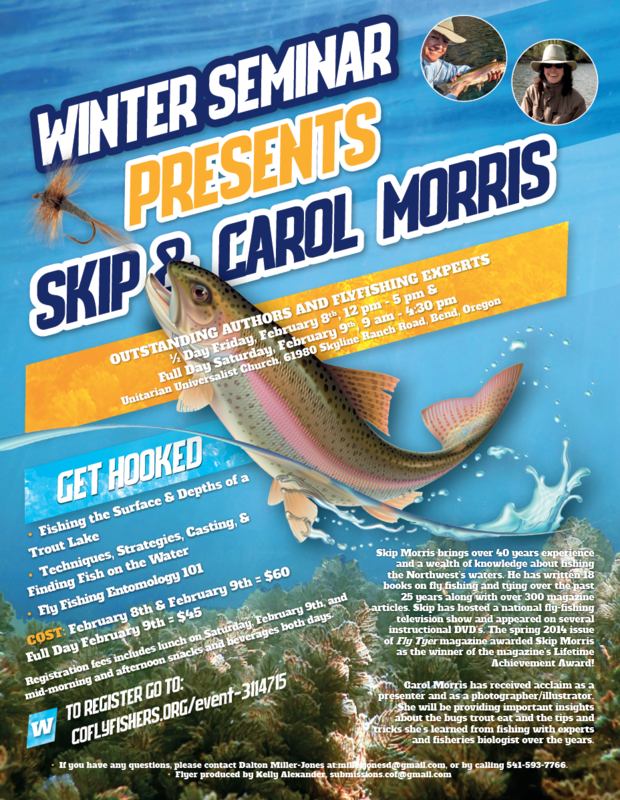 Carol Morris will be providing important insights about the bugs trout eat and the tips and tricks she’s learned from fishing with experts and fisheries biologist over the years. Full Day [9 am - 4:30 pm] FEBRUARY 9, 2019. "Fishing the Surface of a Trout Lake" – This talk guides you through the techniques and the intricacies of chasing and catching path-rising trout. Here you will learn about lake entomology, flies and the tackle that take trout feeding in the top layer of a lake. "Fishing the Depths of a Trout Lake" - Depth is relative-- it ranges from only a half dozen feet down to thirty. Skip will show you how to determine if trout in a lake are feeding deep, what they are feeding on, and how to use sinking and floating lines with weighted flies on very long leaders. “Lessons from the Water: Tips and Tricks About Techniques, Strategies, Casting, and Finding Fish” - Carol has been fortunate to fish alongside a number of professional fly fishers and will share what she’s learned that upped her game catching trout and bass. “Fly Fishing Entomology 101: The Basics about Bugs” Carol’s presentation about the most common bugs found on streams, how to identify them, and how understanding the different stages of the life cycle can improve your catch rate. Carol’s Favorite Dries, Nymphs and Floating Emergers; Skip Tying Emergers and Soft Hackled Flies. Registration fees include lunch on Saturday, February 9th, and mid-morning and afternoon snacks and beverages both days. 2. Select the kind of sandwich you want with that bread. Example: If you select the Hot Paninis, you then need to pick the meat or vegetarian you want and indicate whether or not you want it with cheese. Lunch comes with Beverages; Garden Salad and Chef toppings; Vegetable Crudités and Red Pepper Dip; Seasonal Fruits, & Assorted Finger Desserts.